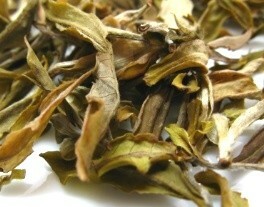 Darjeeling White tea is grown in the Himalayas, in India. It combines the elegance and delicacy of the best white teas with the distinct muscatel flavor of traditional Darjeeling brews. Unlike other types of Darjeeling tea, this white tea is made mainly of the new downy unopen buds and sometimes the next one or two leaves in the stem. This pale golden liquor preserves the characteristic nutty flavor of the Darjeeling tea blended with the benefits of a white tea. Let’s travel to India and savor this unique tea. Darjeeling tea has been produced in the Himalayan region since mid-19th century. Tea industry quickly grew in this region with such quality and obtaining such popularity that Darjeeling tea is today exported from the nearly one hundred tea gardens to all corners of the world. Most of this tea has been produced as black tea. However, recently the white tea variety has been gaining popularity among tea connoisseurs with a few estates starting to produce it. 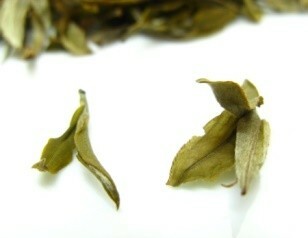 The Darjeeling white tea is quite similar to the Chinese white teas, such as Silver Needle tea. This Indian white tea is made up a bud and two young leaves still with their fine downy hairs that give them the distinctive silver color. Even though the Darjeeling tea plants are descendants of the same Camellia Sinensis plants brought from China long ago, the soil and climatic characteristics of this Indian region have imparted on the tea a particular flavor and fragrance. The continual presence of dry and humid air, sun, monsoon rains and a loamy soil, make the Himalayas the perfect environment to grow this white tea. Let’s take a quick look at how this tea is processed. Growing at an altitude of almost 2000, it is the minimal processing to which this Darjeeling tea is subjected that distinguishes the white variety from the more famous Darjeeling black tea. Tea leaves are allowed to grow more slowly making this a rare, tasteful but expensive tea. And then harvesting begins. This wonderful tea is extremely rare as it is handpicked only from a few tea bushes. Harvesting is done carefully to make sure that only new unopened tea buds with the two young leaves surrounding it are picked from the top of the bush. This white tea may be picked in the first flush (harvesting) from late February/early March to mid-April, rendering a tea that is delicate and floral. It may also be picked in the second flush from late May to June, resulting in a tea that has a nutty muscatel flavor that is quite refreshing. After harvesting, the tea is rolled by hand, carefully not to damage the leaves and bud. Then it is withered in the sun, which can be quite a difficult step in the process considering that the climate in the Darjeeling estates is typically cold and rainy. 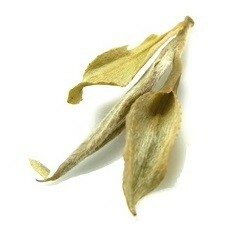 Once withered, it is then dried under soft heat to prevent further oxidation of the leaves. Carefully selected and graded, the tea is finally ready for packaging and shipping. See more information about Darjeeling history, flushes and grades at Darjeeling tea. Now let us enter the world of Darjeeling white tea health benefits. The leaves in this variety of Darjeeling tea contain a high amount of antioxidants, namely catechins. These components along with other vitamins and minerals will provide you with a variety of health benefits. Frequently getting ill with a cold or the flu is a sign that your immune system is weakened. You need to boost your defenses against bacteria and viruses as well as other harmful agents. Being a white tea, this Darjeeling tea has a high amount of antioxidants, which boost your immune system and build your defenses. Take a cup of this tea when you feel a sore throat, its sweet flavor will feel delicate and mild as you swallow. Did you know that a good cup of tea can help soothe stomach problems? These may be caused by eating too much of the wrong foods or simply by stress. Indigestion or acid reflux may cause painful discomfort. Darjeeling white tea is rich in antioxidants, vitamins, minerals and amino acids. All these components help not only to soothe the whole lining of the digestive tract, but also accelerate your metabolism, making you digest foods better. A healthy digestive system is a good way to promote weight loss. With this tea your body metabolizes better and faster the foods you eat, blocking fat absorption, and it helps you get rid of undesired wastes, too. Unfortunately, there are no miracle diets, but drinking Darjeeling white tea with a good healthy meal can help you start on the right path. At the same time, the caffeine level in this Darjeeling tea is high and it will give you the energy boost you need to get up and do regular physical exercise to complement your diet. Darjeeling white tea is a great ally when it comes to preventing heart disease. Again it is the antioxidants present in the tea help to lower blood pressure and bad cholesterol levels. This tea also helps to strengthen your circulatory system, helping to prevent clot formation which can lead to heart attacks, strokes and other cardiovascular diseases. At the same time it is said to help lower and control sugar level in the blood, thus reducing the risk of diabetes. Tea is a great source of an amino acid called L-Theanine, which makes you feel relaxed and calm at the same time. Mixed with the caffeine present in this tea, you will feel a calm awareness, helping you to keep focused. White teas like this one may also improve the health of your skin. Antioxidants fight the damaging effects of free radicals on cells and promote cell renewal, thus preventing signs of premature aging and leaving you feeling clean and young. This is indeed a great Indian white tea. 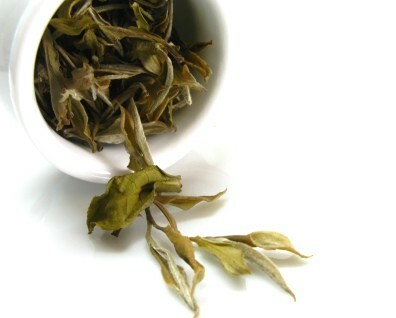 Take a moment to read the general white tea health benefits it shares with other white teas. Buy Your Darjeeling White Tea Today! If you are sensitive to caffeine then the caffeine levels found in Darjeeling white tea may constitute an unwanted side effect. This tea contains a high level of caffeine, which is common among teas that essentially made up of young tea buds. Studies have found that tea plants store caffeine in the buds to protect themselves against pests. From difficulty falling asleep to insomnias and lack of sleep. If you particularly sensitive to caffeine you may find yourself irritable and with your nerves on end. Be aware of irregular heart beat and palpitations. If you are pregnant, then check with your doctor whether you may or may not drink caffeinated teas. Most likely, your doctor will ask you to switch to decaffeinated or herbal blends. Now let’s move on and enjoy a cup of white tea. To get the most out of your tea and to enjoy all the white tea health benefits it can offer, you should learn how to brew Darjeeling White tea. Choose a round teapot so that the leaves may swirl freely in the water and brew your tea to perfection. Either ceramic or glass teapots are fine, the latter allows you to enjoy the show! Start by preheating your teapot to maintain your tea warm. Just pour hot water into your teapot and once the walls feel warm to the touch, discard that water. You may do this to the cups as well. Place two teaspoons of loose leaf per cup in your chosen teapot. This is fluffy and light tea, which is why you may need to add more tea in volume, not weight to your teapot. Make sure you use high quality water when making your tea. After all, this tea is so rare and exquisite that it would be a pity to ruin it with poor quality water. 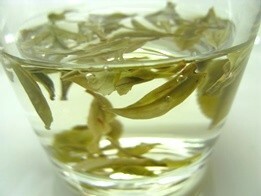 White teas are very delicate so you should not use boiling water: the ideal temperature is around 75ºC - 80ºC (167ºF - 176ºF). Boiling water makes your tea taste bitter and astringent and cooks the leaves, making them useless for additional brews. Depending on your taste, the steeping time may vary from 40 seconds to 2-3 minutes. When steeping for a second and even third time, you may need to increase steeping time to get a good flavored tea. Strain the white tea into your teacups. 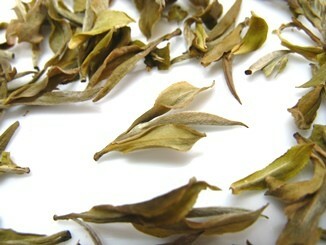 If you plan to rebrew the same tea leaves, make sure to empty the whole teapot to stop the leaves from brewing. Enjoy a tea that is of a pale yellowish color with a honeyed fragrance. 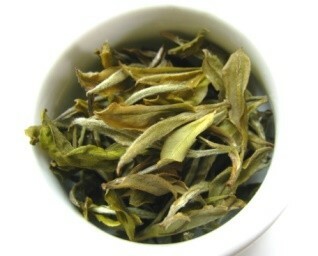 Choose white teacups so that you can get a clearer view of the color of Darjeeling white tea. Drink it plain. 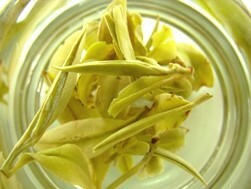 The mild sweetness in this tea and its muscatel traces are best appreciated when no sweeteners or milk are added to it. For a stronger tea, remember that you can always adjust the amount of tea or the steeping time, but increasing the water temperature will ruin a good white tea. Here is a tip: To better preserve your tea and keep it fresh, store it in an air tight container, in a dark cool room. Savor the moment as you enjoy a cup of a truly magnificent tea. Darjeeling white tea is a surprising beverage. Let each sip take you on a healthier journey.